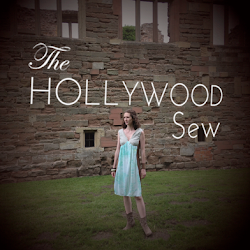 In honor of back to school, and the weird still summer, but almost fall season, I'm giving away a pattern that's extremely versatile! It's a school jumper, and it will look cute in the last few weeks of summer, and even more adorable layered in the fall. The downside is that it's a bit on the smaller side. I thought about enlarging this pattern to fit me, but I figured I wouldn't get much use out of it anyway since it's not totally my style. But it could work amazingly for you! 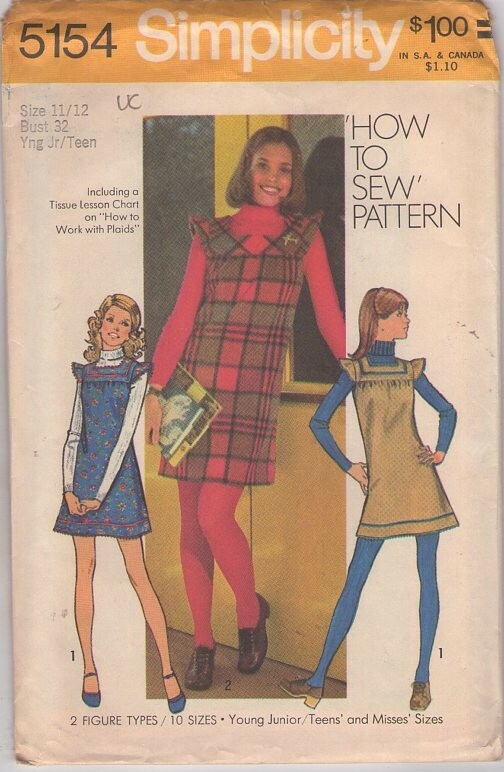 So it's Simplicity 5154 from 1972. Size 11/12. Bust 32". Waist 25". Hip 35". 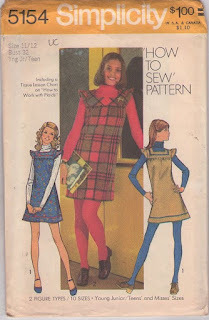 All the pattern pieces are included (though they are cut), along with instructions and a handy guide for sewing with plaids. Leave a comment below telling me where you'd wear this. 1. Follow this blog and leave a separate comment saying that you do. 2. Tweet about this giveaway and leave a separate comment with a link. 3. Post this giveaway on Pinterest and leave a separate comment with a link. There are 4 ways to enter, additional entries/comments will be deleted. Two winners will be selected via random.org and the winner must respond within 48 hours or I'll select another winner. I'm opening this one up to other countries - so anyone from any country can enter! Contest ends August 28th at 11:59pm EST. On the school run of course, and I have the perfect tartan fabric already in my stash. Looks like it's too small for me, so I wouldn't wear it, but I've make it for my cousin's kid to wear to school. Not sure where I'd wear it, I don't get out much. but I'd wear it! I'd wear it to work.